This was the fourth fencing mask, a used one the coach let me borrow, I just painted with my airbrush which was supposed to be on display at the recent Middlebury Annual fencing tournament, however there wasn’t time and one of the parts went missing. It turned out I misplaced the crown cap that went missing and had to go to an airbrush forum for help on finding the right part for it. After all, as a completist myself, I like having my airbrush entirely intact and ready for use. Fortunately, a good samaritan quickly responded to a post I made and offered to send me a part by mail which just saved me a lot of time and trouble. One can see that the Medea part that came in the mail actually fit my classic Iwata HP-C beautifully which has lasted me for over 20 years and still going like a workhorse. The crown cap. One can see the label showing the model part relating to it. The crown cap in close up that fits nicely on my airbrush. And then once I was able to figure out how to clear up the fluid nozzle, the needle glided perfectly back and forth without any resistance of dried paint internally. It was like the good old days have returned with restored fine lines during the test run. From that point on, I started to use the black, white and red Wicked Color set to finish up the fencing mask project. The result ended up as a gargoyle or some sort of demonic face with horns. Front part of the mask. It's been a long winter and I've noticed that less blogging on my part is contributed to my being focused on other things and slacking. However, I plan to eventually revamp this site to a new engine that's more on the gallery and less on the blog activity. However, what's new this month is a recent t-shirt design I did for the Vermont Fencing Alliance's 25th anniversary event coming in March which I'm excited for and plan to compete. Fortunately, I will be competing in two events rather than three now that I have achieved an E rating in Epee on my birthday a month ago. What a huge relief it was with hard work paying off. Anyway, everything I did on this shirt was done entirely on my iPad Pro using Procreate and exported to Adobe Illustrator to finish off the project, inspired by the art nouveau period which is what my coach had in mind. And I think it turned out great. I cannot wait to see how the shirt will look in a few weeks! Years ago, I got into airbrushing during the time I was in art school and owned the classic HP-C Iwata airbrush. This thing was an engineering marvel which never broke down on me The Paasche was the other I had and it worked pretty well except for the certain times I had difficulty creating thin lines. The problem, at the time, was that I had a small air compressor which was a single motor without a tank and it was quite loud. I had to pull the plug every time it got hot and waited for it to cool off in order to resume the work. But I enjoyed the airbrush process and how the paint flowed onto the surface was fascinating to me. I got into it when an old neighborhood friend of mine, who's a talented artist, purchased an airbrush with a huge silent compressor. When I first saw it, I was stunned to see the incredible details he was able to pull off and the medium was new to me. I owe it to him for opening my eyes on this incredible tool, among other techniques. After I finished art school, I stopped using the airbrush and went into other media. I moved around a lot back then and lost two air compressors. The loud motorized one and the other was a pitch black box from Aztek, I believe, were the only ones I had. When I moved to Vermont, I lost both of them in the process and could'nt locate the items. But the Iwata still remained in my possession. Until now, when a friend of mine privately hired me to custom paint his HEMA (historical european martial arts ) fencing mask based on the heraldry of the design I did for him over a year ago. All of a sudden, it was my chance to get back into it. So I had to get a new compressor and start all over from scratch. My Paasche then broke down due to the nozzle tip that snapped. I couldn't use it again and had to buy a second hand vintage Paasche V from a local person. This brush was much older from the 1980s and surprisingly, it worked. But the Iwata is still my favorite workhorse which had not failed me over the years. And that needle which was inside of it was still there since the last time I used it in the old days. It was in perfect condition that shocked me because ordering airbrush needles are not cheap, let me just say. 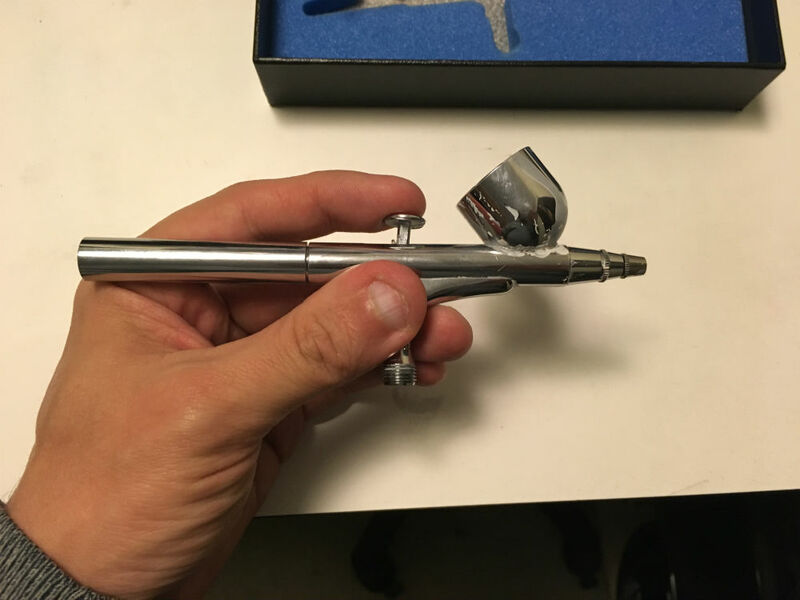 My Iwata HP-C airbrush. A solid classic revered by many. Zeny airbrush compressor with a motorI had to order new Wicked Color paints from Createx so that they would flow better through the airbrush than the opaques which were causing problems to the needle and nozzle areas. The new air compressor from Zeny did the job perfectly well for the level and scale of my project. Especially the new paint had to adhere to the apparel surface of the mask which was important. And best of all, it's got a tank with the moisture trap which was badly needed. Worked out the visuals on the Concepts app on my iPad ProI then got to work on my iPad Pro to visualize on the Concepts app of how the mask would look and the way his creature's mane would flow. I swear by Concepts for many things and made things more streamlined. It took several iterations to get it right. The final results can be seen below. Front of the mask The side of the mask The back of the maskIt took me a few days to complete it after some re-adjusting to the compressor and getting the paint volume right. This was a lot of fun and my client is very please with it. Especially since it's part of the SCA form of fencing that's partly related to my interests. As an epee fencer myself, it's really a great way for me to run wild with this and learn from this experience on how to airbrush again. Now the thought of doing a large scale airbrush illustration intriques me especially if it's something for the Art of Horror group exhibition in October. I think I may buy one more airbrush along with a few other necessities to complete the kit and add more colors for future projects. Some time ago, I created three prints based on each weapon of classical and olympic fencing using different gods to represent the past connecting to the present. It was also part of something I had in mind to expand on in the future as a way to introduce and educate people on this sport. For about nine year now, I've been fencing epee and really enjoy the aspects of the game but also the physical workout it provides for me as an artist to stay in shape. And each year or every other year I would contribute my talent to the fencing community to design a t-shirt. Although, I'll be doing the twenty-fifth anniversary shirt in Spring of 2018 instead. This time around, I've decided to contribute three prints from my Society6 online store to the Middlebury Open tournament on weekend of March 1st, which occurs every year by tradition, where they have raffle prizes to give out when people buy enough tickets. The money is used as a fund raiser to support next year's budget for the Vermont Fencing Alliance. This is only one of these unique times when I contribute my work to the community because I enjoy this sport very much.